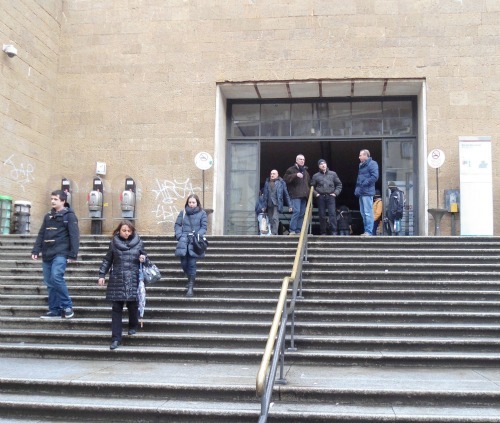 Welcome to your Florence train station insider guide! 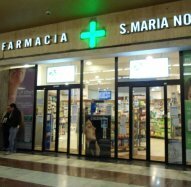 The main Florence Train Station is called Santa Maria Novella (SMN) and is conveniently located in the heart of town just a few minutes walk to all the main sights. Remember this ‘SMN’ because that is what you need to look out for when booking tickets or pulling into town: ‘Firenze S.M.N.’. Italian trains are efficient, clean and very affordable. Rail travel is also a great way to take day trips from Florence. With a train you arrive right in the downtown area of most Italian cities. And Italian trains are also getting faster and faster. Now you can zip over to Rome, Venice and Milan in a fraction of what it used to take. No worries - with these guidelines, and you’ll be getting around like a Florentine veteran! 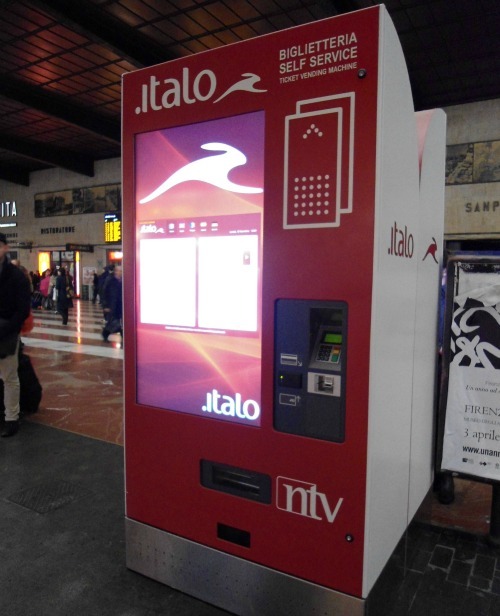 There are two ways to get train information at the Florence train station. Look at the yellow train schedule boards found on each platform - these list every train that leaves from the Florence train station. (To get train information online use the links at the end of this page). Here are some examples of how to read the train info. At the top is a train to Naples. The red color and writing that says 'Frecciarossa' means that it’s a high speed train (these cost more). On the left you see the time it leaves (9.04 am) whereas the number in the blue dot on the right tells you the platform it usually leaves from, track 11 (but always check the up-to-date monitors to be sure!). The second is a train going to Rome, and you can see that it makes many stops before arriving at Termini station at 12.47 pm. This is handy if you want to go to one of those smaller towns, for example, Montevarchi, a VERY popular destination for shoppers – that’s where the Florence mall for designer outlet shops are! 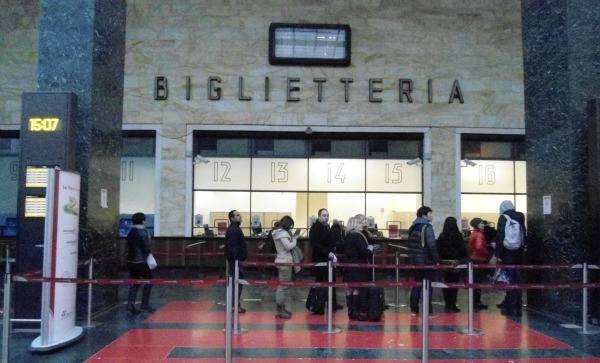 This is the tried-and-true old-fashioned way to get a train ticket, you just go to the ticket counter at the Florence train station where there is a person who serves you. But this mean you'll have to wait in a line that could be long and slow...do you really want to waste precious vacation time? Using the handy ticket vending machines is fast and easy. There are 3 types of machines though, see pics below and read to recognize the difference. 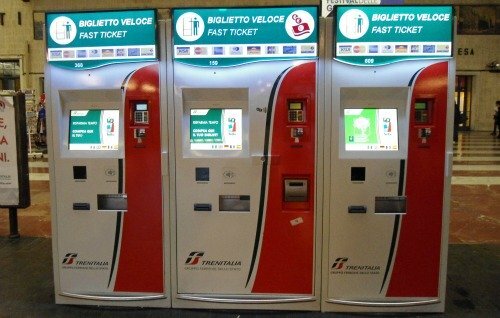 The shot below shows the most useful machine for getting all types of tickets to go basically anywhere - notice it says 'Fast Ticket' at the top. Insider Tip: do like the locals do and save time! 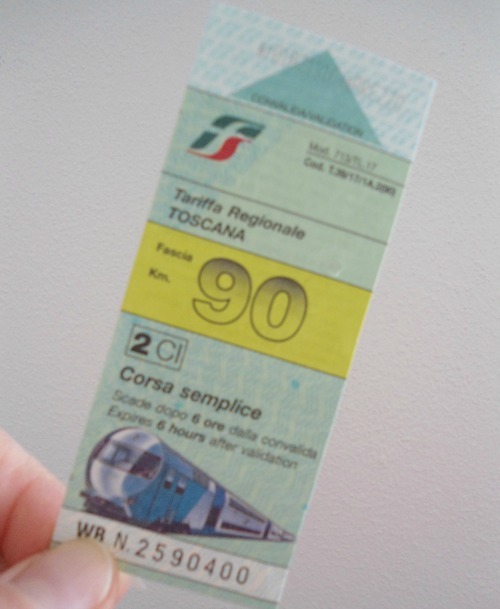 There’s a ticket called ‘biglietto regionale’ that you can use to get anywhere in Tuscany, at it takes just a second to buy! You simply go to any newsstand at the station that shows the sign ‘biglietti’ or ‘biglietti regionali’. You ask for the destination of your choice, pay the person, and you’re done! Remember though to stamp the ticket before you get on the train - see 'Stamp Your Ticket' below. For a two-way trip you need to buy two tickets as each ticket is only good for one way. These tickets cost exactly the same as buying the other ways, but are MUCH faster to purchase. This is a great insider tip! 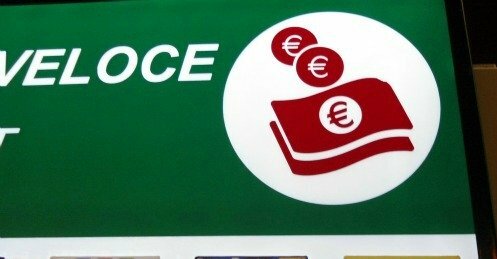 Almost all travel agencies in Florence provide a train booking service for a very small surcharge. Just go into any agency you happen to see and ask them to book for you. They do all the work and print out your ticket on the spot, and you're done in a jiffy! 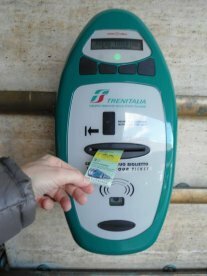 If you prefer to book online you'll find the link to the official Italian railway site, Trenitalia, and another good site for booking at the end of this page. Machines are a snap to use, just choose your language and follow the instructions. Most machines take both credit cards and cash, but some only take credit cards. It’s so annoying to go through all the touch-screen selecting, choose your tickets and then find out when it comes to pay that the machine doesn’t take cash! It’s easy to avoid this. Once you have your ticket you must stamp it before getting on the train. This validates the ticket for use. There are fines for non-stamped tickets so look for the machines on the platforms and stamp before getting on the train. Many people fly into Rome and then take a train to Florence – this is often cheaper than flying here directly. Note: the first train from Rome to Florence leaves at about 6 am and the last at about 8:30 pm, outside of these hours you may be stranded in Rome! A Regionale Veloce, literally a ‘fast regional’ but it’s a misnomer because it takes nearly 4 hours! 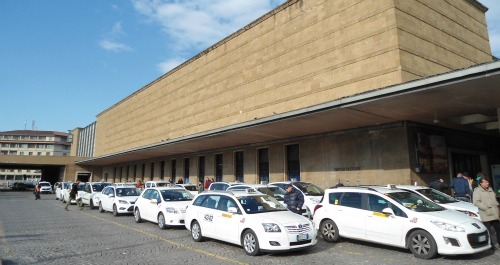 If you are coming from the airport in Rome and you’re then getting a train from Rome to Florence, you will have to first get a train from the Rome airport to Termini train station. Then, from Termini to Florence SMN. NOTE: the track where you pull in coming from the airport is VERY far from the tracks with trains that go to Florence. Give yourself a good half hour or even 45 minutes between connecting trains so you have time to get to your connection. 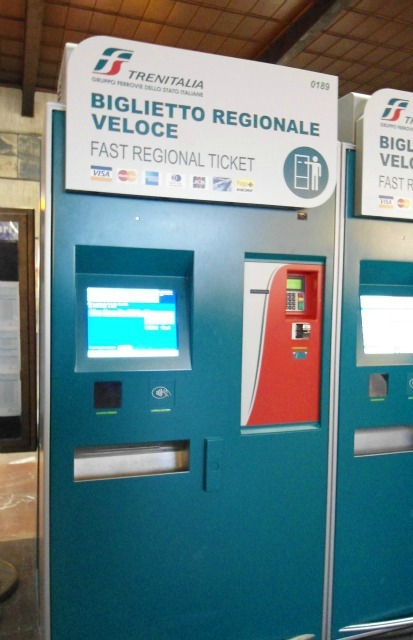 You can easily buy your ticket at the ticket machines in Rome, but if you want to book your train from Rome to Florence ahead of time, see the links for train information in Italy at the end of this page. There are two main exits/entrances to the Florence train station. To go towards the heart of town, go out from the side near the pharmacy. Leaving from this side also takes you to the stops for the most used bus lines and the taxi stand too. To get to the cabs, go right after exiting the station from the pharmacy side. And BTW, the exit on the other end of the station has a lot of steps so avoid if you have lots of luggage! Lots of steps on this side! 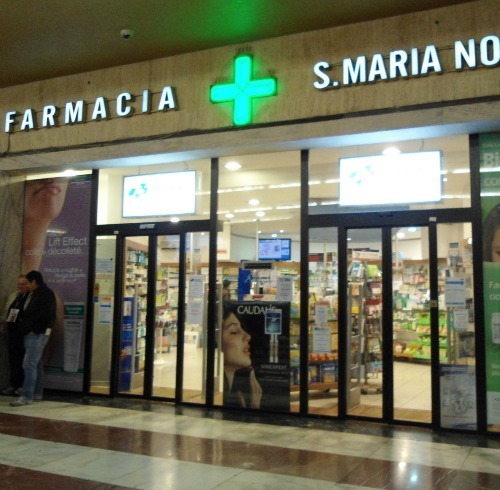 It is named after the Santa Maria Novella church, located right in front. The station was built low and on a horizontal plane (see pic at top of page). This was done intentionally so as not to over-shadow or block the view of this great cathedral. 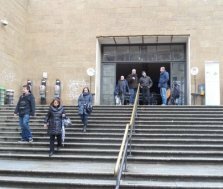 The Florence train station was built in 1935 after its design was approved by none other than Mussolini who was in power at the time in fascist Italy. Near platform 8 is a plaque in memory of those who were deported from Florence to concentration camps during the second World War, leaving from this very track. SMN is one of the few examples of modern architecture in Florence (although a new and very modern Florence Opera House is currently being built at the Cascine park).